Elton John‘s Goodbye Yellow Brick Road super deluxe edition box set was released almost a year to the day and despite the modest proportions of the package it was a reasonably generous set even at full price. Now however you can pick up this 4CD+DVD+hardcover book package from Amazon Italy for less than £20! 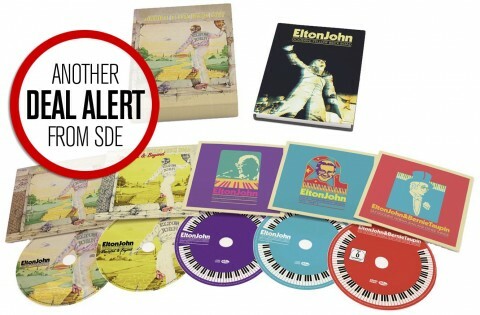 Yes, Elton’s 1973 classic in its 2014 box set form is just €27 or a little over £19. NB: If you have signed up for the SDE DEAL email alerts then you would have been notified about this deal at 16.15 today! Thanks for the Alert. My copy arrived this morning from Amazon Italy. First time I had taken up the offer of an overseas alert and found it no hassle at all. I had wanted this item since its release and nabbed it at half the price last Thursday. Well done SDE for bringing us these fantastic deals. The modest P+P cost is always factored in by SDE in considering whether they think it’s a good deal or not.. Of course, you make the final decision, and the total price is always stated before you commit to buy, so please don’t be worried about ordering from non-UK amazon..
Francis that is simply not true. Your Amazon account works for other Amazon sites as well. Shipping is only about £3.50 for a box set. You can often save 50% on Amazon Germany compared to the uk site. Amazon prices are constantly going up and down, even with pre-orders. It is a right pain in the a**! I ordered a CD collection at a low pre-order price only for it to drop even more the day it was released! As for ordering the Elton John Set or any other “so called” deals from a non UK Amazon website, surely you have to go through all the hassle of registering with them plus there would be shipping costs, so maybe not that great a deal after all. That covers CD was such a bad idea! Surprised he didn’t put in a Kanye west remix CD as well! Anyone know why when I translate the site to English the price changes to GBP but not at a converted rate i.e. price is now €44.11 and when translated it shows as £44.11? Should I just leave the page in its original language and put the item in my basket and hope it converts correctly to GBP? I clocked Roxy Music’s Complete Studio Recordings for €58 and hoped to get it for £41 but when translated it showed at £58. Confused (it doesn’t take much). I have just bought the Roxy Music box set from Amazon Germany today for €49. With delivery it comes to £40.73 in total. I have been waiting ages to get it at a good price and had almost given up. Thanks a lot. Just ordered at the same price. Top man! Perhaps Paul could make people aware of this. Glad you managed to get it for that great price. I know what you mean, this week alone I have bought the Simon and Garfunkel box set and today the Roxy Music one, but both for great prices. Now I am thinking of getting the Nilsson box set. Thanks Bob, that Roxy Music box is a great deal. Been wanting to get that for a while too, don’t think they will be many more chances to get it for that great price. Dammit….10 minutes too late !! Unlucky. Was rather hoping this deal would last longer. Sorry to everyone who missed it.